The district around Brampton Bierlow has a long history. The name itself has Old English and Norse origins. Brampton is from the Old English "brantone" for "steep enclosure" or "area covered with brambles". Bierlow comes from the Norse "byar log" meaning "township law", which was an area with a measure of self government, or where the law was administered. This may be the source of the term "bye-law" in modern usage. West Melton as a place name also has its origins from this time. The Old English "midleton" and the Norse "methaltun" essentially having the same meaning of "middle farmstead" or "middle enclosure". The prefix West seems to have been added in the middle ages to differentiate the hamlet from High Melton, and certainly does not appear in the Domesday Book in 1086, wherein it is referred to as Medelton. The Romans seem to have skirted round the area. There is some evidence that the Ickneild Street, also known variously as Rickneild or Ryknild, passed by about a mile and a half to the north via the Abdy area and down towards Golden Smithies and Swinton on what is now referred to as Roman Terrace. This "Roman Ridge" seems to have been a natural border in Anglo-Saxon times too, with Scandanavian settlers holding the area, with the place names demonstrating this. It would seem that the Brampton and Melton area was very much a rural one with a number of individual farmsteads, although there were settlements in the area prior to 800AD, and a number of farms were listed in the Domesday Book in 1086. Amongst the landowners at the time was Arnthorr, a Saxon priest, who held lands in Brampton and West Melton which was arable and had two plough teams. Arnthorr held one of four "berewicks" and other owners at this time was Swein, who also held some land in Melton, Brampton, Thorpe and Wentworth. By Norman times, the whole of the area belonged to Ilbert de Laci, a Baron who had come over to England with William of Normandy, and who gained lands in Yorkshire land for his efforts, becoming 1st Baron of Pontefract in the process. Ilbert's son, Robert, the 2nd Baron Pontefract, went on to found St John's Priory for Cluniac monks near his family's castle at Pontefract. In the late 13th Century, in the reign of Edward I, the ownership of the lands around Brampton was split between William le Fleming and the "Honour of Tickhill", which was held by the Fitz Swein family, who were of Anglo-Saxon descent and tenants of the de Laci's. Adam Fitz Swein (later Adam de Bretton), who founded the Priory of St Mary Magdalene of Lund at Monk Bretton in 1154, gave the abbey all his estate at Brampton, Newhill and Rainborough. William le Fleming gifted parts of his land to the monks of Bolton Priory in Wharfedale in 1257, including his Monk Dam water mill at Newhill. With the dissolution of the monastries the local abbey estates passed in 1538/39 to the Fitzwilliam family of Wentworth who also acquired the lands owned by the le Flemings. The 1379 Poll Tax rolls show 96 taxpayers in Brampton, which was listed as Brampton-juxta-Wath at the time. During medievel times the area would have relied on farming as the main source of employment. The population though was sparse, and people living locally would have worshipped at the established churches in the nearby villages of Wath-upon-Dearne and Wombwell. The Dearne and Dove canal was completed in 1797 but this had little impact on the faming hamlets around Brampton. The Ellis Trust went on to provide a master's house for the school in 1738, and both the school and house were rebuilt in 1791. A separate infants school was built in 1866 close to the Church and in 1930 a senior school was added behind the original 1711 school. A fourth school, Hemingfield Ellis primary was also endowed by the Trust. Although the senior school, which became Brampton Comprehensive, was closed in 1985, the Ellis Trust continues to support the two junior schools and the infant school to this day. The schools' motto "Mea Gloria Fides" ("Faith is my Glory") comes from the Rockingham family and is emblazoned across the massive front of the Wentworth Woodhouse. The schools funded by George Ellis' will celebrated the 300th Anniversary of his Trust in 2011. George Ellis is buried in the churchyard at Wath-upon-Dearne All Saints Church and a memorial to the family can be found inside. The earliest evidence of mining in the area comes from Cortworth in 1486. Mining of coal from near the surface continued over the next couple of centuries but it was all very small scale, with agriculture being the dominant employment. But by the early 19th Century the growth of industries depending on coal for power had started, not least of which was the railways, and the discovery of coal seams in the Brampton area meant that mining started to become a significant part of local life. In addition to the farms, a number of small iron works had been set up in the area but these were soon replaced by mining as the major local industry. The first pit sites to be worked were at the bottom of Melton Green and on Packman Way, at what local called Home Pit. At the other end of Brampton, Willow Main and Cortwood Colliery were developing. More and more houses were needed to accomodate those working in the mining industry, and the parish of Brampton Bierlow was formed due to the increasing population. 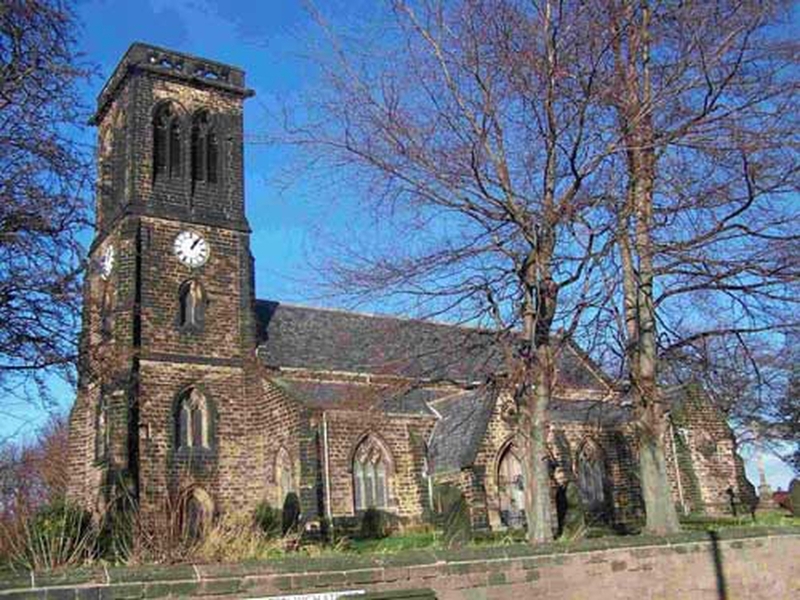 The new church planned for West Melton and Brampton Bierlow was designed by renowned architect James Pigott Pritchett. Pritchett was born in Wales in 1789 and after studying at Cambridge, with his partner Charles Watson were the major architects in Yorkshire, and he worked for three successive Earls Fitzwilliam. Pritchett parted with Watson in 1833 and formed a business with his sons Charles and, later, James. Amongst his other work locally are St Mary the Virgin at Rawmarsh and Holy Trinity, Thorpe Hesley. The foundation stone of Christ Church was laid on 8th November 1853 by the Right Hon. Charles William, the 5th Earl Fitzwilliam. The Fizwilliam family who lived at Wentworth Woodhouse owned the land, and donated one acre, together with timber and £1,000 towards the cost of the building work. The tower of the new Christ Church was 70 feet tall, and was topped by four pinnacles, one on each corner. These have long since been removed but similar ones still exist at St Mary's at Greasborough and at St Mary the Virgin at Rawmarsh, the latter being another Pritchett design. The sandstone for the building was quarried locally. No evidence of the quarries remain, but two street names, Quarry Bank in Brampton and Quarry Hill Road at Newhill give clues as to where they were. After almost two years, and at a total cost of £3,000, Christ Church was consecrated on Tuesday, 21st August 1855 by Most Rev Thomas Musgrave, the Archbishop of York. The 5th Earl, who died aged 71 just two years after Christ Church was completed, had succeeded his father to the title Earl Fizwilliam in 1833. Prior to that he had been an MP, first for Yorkshire and then for Northamptonshire, from 1806 to 1833, and had dedicated himself to the acquisition of knowledge, scientific, botanical and agricultural. As Viscount Milton he had been President of the Royal Statistical Society three times. As the 5th Earl he had funded buildings across the Wentworth estates, including the Mechanics Institute in Wentworth, Reform Row in Elsecar and a flour mill, also in Elsecar, as well as Christ Church. An artists impression from 1853 of how the building would look based on architects drawings was found quite recently in the Church. Mining continued to grow in the area and in 1873 the Brampton Colliery Company sank the first shaft at the new Cortonwood Colliery. The village soon got larger with the company building 106 new houses and a new school, which opened in May 1882 . The houses, known as Concrete Cottages, were built in eight rows on a triangular site near the colliery entrance, and were unusual for their time being built of concrete. There were no street names, just numbers, and the flat roofed cottages were simply known as "Concrete". Later more housing was built on Knollbeck Road, Knollbeck Crescent, Cliffe Road, Rother Street, Becknoll Road and Wath Road. The brick-built "Concrete School" expanded constantly, starting with 36 children aged between three and seven in one classroom, and when it closed in December 1932, 206 children in four classes, including two in the nearby Methodist Chapel. The new West Riding Council School opened in January 1933 and it is this school which still stands today. The Concrete cottages themselves survived until 1958 when they were demolished. Census records show that the population of Brampton in 1801 was 860. By 1848 the population had grown to 1704 and twelve years later it was almost unchanged at 1741. However, between 1871 and 1881 the population doubled from 1978 to 3704, as miners from the northern coalfields came to work at the new colliery. In 1901 the Fitzwilliam family donated more land to the church to extend the graveyard. The first burial had taken place on 11th September 1855, just three weeks after the church was consecrated. The 50th Jubilee celebrations at Christ Church in 1905 saw something of a refurbishment. The oak rood screen, featuring the figure of Jesus on the cross, flanked by his mother Mary and St John, was installed as was the carved oak panelling behind the altar. Most of the oak furniture within the church dates from this time too, and the organ was installed in 1905 and was built by the Durham company, Harrison & Harrison. The mosiac floor of the sanctuary, beyond the rood screen towards the altar, was laid in jubilee year. From 1873 until it closed Cortonwood Colliery was the main employer in the parish. In 1923 1738 men and women worked there, and by the time of nationalisation in 1947, the number had risen to over 2100. In a notably dangerous industry Cortonwood had a good safety record, with only one underground disaster. Around midnight on 9th December 1932, six men were killed when a gas explosion occurred on a narrow coal face, four were killed immediately and two later in hospital from burns sustained. The decision by the government to close Cortonwood Colliery in March 1984 is generally accepted as one of the main causes of the year long miners strike. For twelve months Cortonwood and Brampton featured regularly on news programmes, and in a time when there were only four TV channels, the new Channel 4 broadcast live from Cortonwood Miners Welfare, which was strike HQ. After the strike was settled the pit was one of the first to be closed, in 1986, taking away Brampton's main source of income and employment. Times for many were tough in the late 1980s and 1990s as other pits in the area closed one by one. In recent years though the area has seen the growth of new enterprises and light industries, including a new retail park on the former colliery site. The owners of Elsecar Heritage Centre recently announced plans to extend their heritage railway line through from its current terminus at Hemingfield to a new station at Cortonwood retail park, and rename it the "Coalfield Line". The parish continues to grow in population with new housing estates built on part of the former Colliery site and also on the former site of the Ellis Comprehensive School.